Situated on the East Coast of the United States, York County, South Carolina is approximately halfway between New York and Miami. 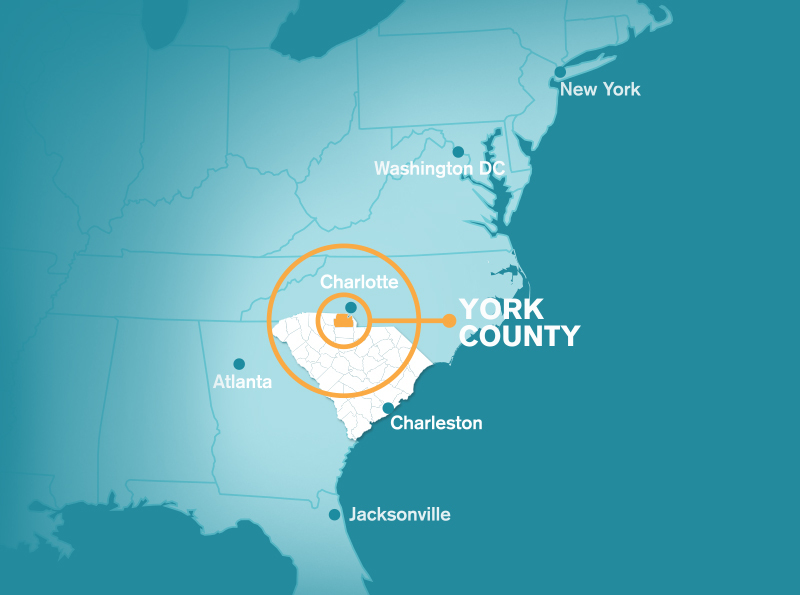 Closer to home, York County is just minutes from Charlotte and the nation’s sixth busiest airport (CLT). This means air travelers can reach their destinations more quickly, and companies that rely on shipping by truck are within a two day drive of more than 200 million U.S. and Canadian consumers. If you’re looking for a location with mild winters and plenty of time to enjoy the great outdoors, then you’re in the right place. York County’s average high in summer months is just shy of 90 degrees Fahrenheit, and in the winter it’s in the mid to upper 50’s. While snow is possible, it’s a fairly rare site. York County gets an average of 1 to 2 inches per year. Avg. Precip. 3.7" 3.1" 3.9" 3.4"